Water Aid Regional Head, call for reportage at all levels on water and sanitation. The head of the regional office for Water Aid in Dakar ,Senegal madam Marime Dem has underscored the need for journalists of the National WASH networks to be present at all discussion when leaders are discussing policy that will make an impact on the nation’s development. According to Dakar regional head, journalist need to be proactive in their reportage in amplifying the voices of the poor and hold their leaders to an account for ever commitment signed unto. Something she said it was important for strong citizens to demand for the rights of the people and call duty bearers to provide the rights of the people at national, regional and globally. Madam Dem said Journalists are the best people to ensure that the voices of the people are heard and leaders of the people who have committed their support can be put to tax by their voices. Madam Dem noted that during her visit at the UN high level on the post MDGs 2015 meeting, WASH journalists was lacking which was disappointing for her. Something she said was a challenge that they as partners needed to work on to ensure that the visibility of WASH journalists be seem at all time when leaders are discussing developmental issues of countries situations especially as it relates to WASH issues. However, Water Aid regional head said it is dissatisfying to know that women are still struggling to have access to improved water and sanitation and that journalists who are to raise the awareness on water, sanitation issues are lacking of support at all levels. Speaking at the West African Water and sanitation journalists network third bi-annual general meeting in Dakar, senegal, madam Dem call on the national networks to be more vigilant as duty bearers to Forster the cause of WASH at all time. For his part, The senior outreach Communication officer for water supply and sanitation Collaborative Council have acknowledge the important role journalists play over the two year since the existence of the West African WASH Networks. Mr. David Trouba noted that journalists are great people who have the ability to rise the issues of water and sanitation at all levels and hold stakeholders, international partners to account for ever commitment they have signed unto. The senior outreach Communication officer for water supply and sanitation Collaborative Council said achieving universal access to water, sanitation and hygiene WASH journalists need to be present at all levels to ensure that the remaining 2.5 million lives can be save and yield to £150 billion a year for the global economy. Something he believe that journalists reportage on WASH will mean Everyone Everywhere will have access to improved drinking water sources under the MDG on environmental sustainability, which nation target to significantly improve the lives of least 100 million slum-dwellers by 2020.
demand, and gains for the world’s current slum-dwellers may be rapidly undone. The 3-day exercise was held from April 8-10, 2013 at the ONOMO Hotel which brought together 36 WASH participants from the 14 West African Countries and partners to discuss the way forward of the Network. Residents of Kambia Town, northern Sierra Leone have commended the Government of Sierra Leone for providing them with pipe -born water after forty years to address the acute shortage of water and reduce the spread of water born diseases. The Kambia Water Supply Project was made possible through a grant -aid from the people of Japan as a token of friendship and corporation to the tune of eight million dollars through the Japan International Corporation Agency (JICA). Officers of the Sierra Leone Water Company (SALWACO), the Contractor of the Kambia Water Supply Project Dai Nippon Construction Japan and the Consultants from Eight-Japan Engineering Consultants Incorporated have ended a working visit to the completed Kambia Water Supply Project, installed distribution network and staff quarters. Briefing the delegation the SALWACO Kambia District Engineer Yankuba Tarawalley said the Kambia water supply project is now ready for use by the local authorities. He said the source of water for the Kambia Water Supply Project is the Kollenten River, which provides a treated water of 1,200 cubic meters of water per day to an elevated tank of 400 cubic meters. The SALWACO Engineer said the project constructed three hundred taps of one hundred stand post at a distance of 100 meters range, he added that the 2,300 household have also been registered to enable them benefit from the pipe born water. 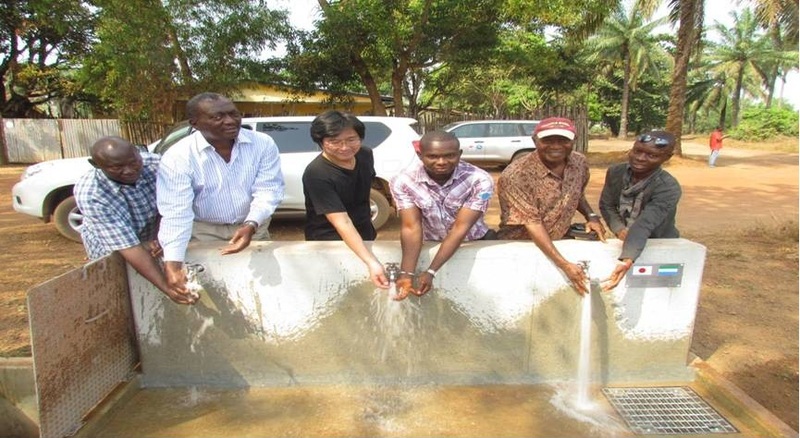 The JICA project Manager Kazumi Matsuda said the Kambia water treatment plant and its distribution network has state of the art technologies that ensure the delivery of safe drinking water to households. He said the treatment plant has an automated system that diagnosis faults on the machinery as local staff will also be trained on the use and maintenance of the Kambia water supply facilities to ensure sustenance of the project. The Ag. Director General of SALWACO Victor Hastings Spaine after a conducted tour of the facilities said the Kambia Water Supply Project is one of the best in the country and calls on Kambia residents to embrace the project. He said SALWACO will provide seed money for the commencement of water distribution within the Kambia Township for a period of three months and called on the Kambia Local Council and the water management Board to support the project. The Ag. Director General of SALWACO Victor Hastings Spaine also stated that his company will also provide technical and managerial assistance towards the Kambia water supply project and also promised to construct toilet facilities within the project site. The Chairman of the Kambia Water Supply and Sanitation Board Ibrahim S. Njai said the people of Kambia have not received pipe born water for the past forty years and assured that the water project will be sustained for the benefit of residents. He appealed to the Management of SLWACO for a continued support towards the water supply project and to also train the technical staff of the project for the use and maintenance of the facilities. Mr. Ibrahim S. N’jai also appealed for transportation in the areas of vehicles or motor bikes as the Kambia water supply project site is a long distance from the township. The Chief Administrator of the Kambia District Council Victor Kalie Kamara expressed thanks and appreciation to the government of Japan and SALWACO for their support and pledged council’s determination to provide a subsidy towards the water project to ensure its sustenance. A resident of Kambia Town who runs the council’s restaurant Adama Turay said the Kambia water supply project is a blessing to the district as they have been suffering to get pipe born water for years which also costs them a lot of money to buy packet water for drinking and domestic use at their homes. She said they are willing to pay for the pipe –born water provided by the Kambia Water Supply Project as it will reduce the financial burden on families and also deaths on water born disease related ailments. This article is produced by Water and Sanitation Media Network, Sierra Leone Chapter in partnership with West Africa WaterAid and Water Supply and Sanitation Collaborative Council. Sierra Leone is one of the places worst hit by poor water, hygiene and sanitation facilities at this time of the year as a result of man’s own activities to its environment. Moving through the major streets of the cities, i.e. Freetown, Bo, Kenema and Makeni, one common feature that is visible is the piles of garbage deposited all over by petty traders after the day’s sales. The drainage are so narrow that most of the waste materials fill these places and flow onto the streets thereby polluting the environment. In the market places, the single dustbin sites built by the Councils are not only overfilled but stinky as these places are left unattended making them breeding grounds for flies, mosquitoes, and mice. It is alarming that when Council and the Waste Management Company are unable to perform their role of ensuring a healthy clean environment, the traders are left with no option but to deposit unwanted materials in various places. Though the places are filthy and flea infested, traders with cooked food or consumable food stuff are forced to occupy these filthy places and sell to the public. It is for this reason that at the start of the rains one is not surprised to hear of frequent reported cases of outbreak of Cholera, Dysentery, etc. What worries most people is that even the roads to these market places are muddy and filthy, yet Council is not doing much to address the issue. There are times suckling mothers will be busy selling consumable goods and at the same time attending to their babies. Apart from spreading diseases to the public, the cold environment is a health hazard to the baby. Looking at the places where most of these traders come from in the morning hours, apart from the congestion of most residential areas, it is a common practice for most to throw their dirt into the drainages rather than depositing them in the dustbins. Others will prefer looking for empty rice sacks or drums to keep their garbage for days and weeks. The ugliest part of this scenario is that when it rains during the night people will be seen carrying their piles of rubbish to be deposited in the gutters and drainages, and at most times in the frontage of residences. Not in the least worried about where the rubbish ends up, it is no surprise that most are found flooding the streets and in some cases where houses are built in low level areas these unwanted materials are flooding the compounds of their fellow community people, while still hampering the smooth flow of traffic and pedestrians as they litter the streets. The situation is unprecedented and has been viewed as very unhygienic as it presents a bad image of the cities to the public, especially visitors to our cities and country. In most areas shrouded with poor WASH facilities, it is very deplorable to witness as household family members defecating in buckets, locked up tightly in their bathrooms only to be thrown in to the gutters and drainages when it rains; it is not uncommon at night to find people defecating in black plastic bags and throw them in the streets, bringing with them flies. It is on this note that people are advised not to pick up black plastic bags found along the streets after a heavy downpour of rain. Another area that is hard hit by poor WASH facilities during the rainy season are the slum areas. Most of our cities especially along the west coast of Africa, special reference to Sierra Leone, are surrounded by slum communities which are mostly located by the seaside or coastal areas. Typical examples are the MOA Wharf, Kroo Bay, and Susan’s Bay to name but a few. With heavy torrential rains, these houses or areas are over flooded with rooms not spared. With this, People at night wake up swimming in their houses or rooms reaching for places of safety. For the past years, the rainy season has been a worrisome moment as animals, properties and human lives are destroyed because the rain washes all along its path into the sea. In the past, there were plans to move the people within these places to safer areas but nothing of this is now heard about. In the city, the poor drainage construction is also of concern to the public as the flooded drainages are a death trap for school children and strangers as there are cases of children having been swept away only to be later found dead. As a result of the outbreak of diseases associated with poor water, sanitation and hygiene practices in our cities, flooding and destruction of lives and properties at this time of the year, the Central and Local Government in the past and present have used various strategies to address some of these burning issues, yet the problem still persists. Before now, it was a common practice by the City Council in collaboration with Clean Salone and the Freetown Waste Management Company to ensure that the city and its environs are clean and environmentally friendly. Most of these strategies have been fruitless as a result of one’s attitudes towards maintaining a clean and friendly environment. Previously, it had been scheduled that the last Friday of every month be “National Cleaning Day”; from 6am to 10am. All were expected to be within their environment cleaning their houses and compounds. Those who are caught along the streets doing nothing were either subjected to cleaning public places or arrested and later fined in the courts of law. Though it was a good drive to ensure a clean environment, it was later misconstrued by certain sectors of the community. While it was meant to clean the environment, others were using the opportunity to throw all the dirt or rubbish accumulated for weeks along the streets. With the lack of man power/trucks on the side of the Council to speedily clear the piled up dirt, the rubbish was again scattered in the streets hampering the smooth flow of traffic. Though it is the mandate of the Council to clean the city, it was ironical that the city ended up becoming the dirtiest place after every cleaning exercise. If today we as a nation prefer a clean environment devoid of health risk hazards, there is the need for all to observe best WASH practices in the sub-region and the country. 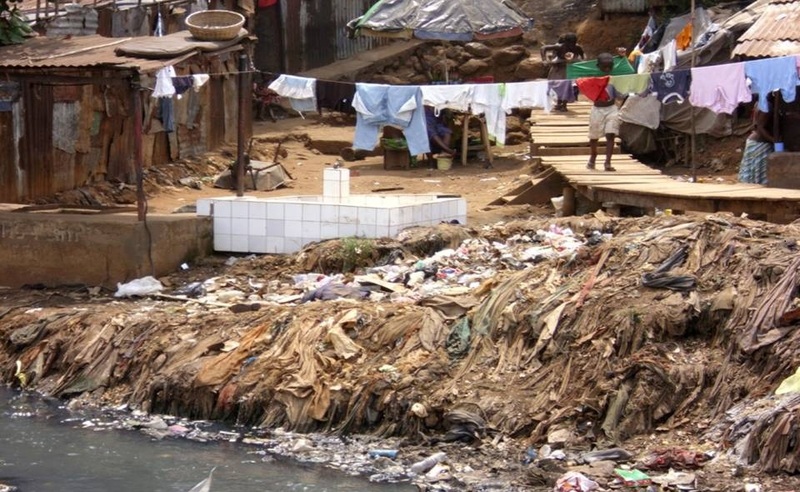 Poor sanitation which has always been associated with Africa, has significant negative effects on the national economy and that 49% of all reported sickness and injuries in Sierra Leone is related to poor sanitation. Lack of adequate sanitation is a major threat to the environment which includes the degradation of the urban environment by the indiscriminate disposal of solid and liquid waste and the pollution of fresh water and lakes by untreated human waste, the result being smaller, contaminated fish catches. Many schools, particularly rural schools had no latrines at all and of those with latrines most did not have separate latrine facilities for girls and boys. Lack of latrines especially separate latrines for girls was identified as the worst school experience for girls. This illustrates that the issue of poor sanitation is one of the special conditions which prevent girls from fuller participation and achievement in schools and to an extent force them out of school.